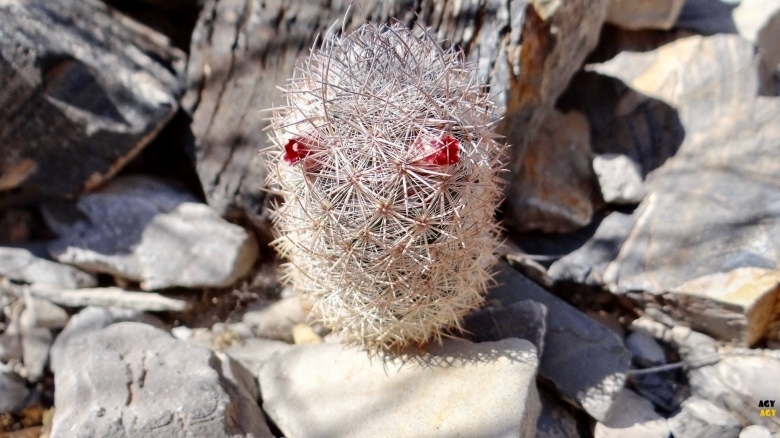 Origin and Habitat: Mammillaria pottsii has a very wide range, is abundant, and occurs in the states of Chihuahua, Coahuila, Durango, San Luis Potosí, Zacatecas in Mexico, and in Texas in the USA (South Presidio Co., North to near Shafter; SW Brewster Co., N to near Nine-Point Mesa). Altitude range: The species is reported at elevations of 300 to 2,100 metres above sea level. Habitat and Ecology: This cactus grows in limestone hills, slopes, mesas, and flats habitats with little if any humus. It occurs in pure limestone crevices in xerophyllous scrub together with Agave lechuguilla. It also grows in gravelly areas of hills and washes in desert. There are no known major threats to this species. Description: Plants more or less cespitose branching basally and along the stems, although single-stemmed, presumably young plants are not uncommon. This species is widely grown in collections but the flowers are inconspicuous. M. pottsii is similar to some plants of Coryphantha tuberculosa and Coryphantha sneedii var. albicolumnaria, both of which occur in the same area, but these species are readily distinguished by stem, spine, flower, and fruit characters. Derivation of specific name: Presumably, the specific epithet honors E H. Potts (1824-88), a mining engineer in the Sierra Madre, Mexico. Reportedly, Potts was a source of cactus plants for the Kew Royal Botanic Gardens in London and ultimately for the foremost German cac-tologist, Salm-Dyck. Instead, the epithet may be for John Potts (see Opuntia pottsii). Stems: Cylindrical or clavate, blue green, (6-)12-15(-20) cm long or more, (1.5-)2.5-3(-4) cm in diameter, and completely obscured by whitish radial spines. The stems of M. pottsii do not produce latex. Tubercles: Almost hidden by the spines, closely aggregated, conical to ovate in shape, 3-5 mm long, blue-green, and tough in texture, without latex. Axils between the tubercles exhibit abundant and persistent white wool. In the flowering zone the longest axillary wool is longer than the tubercles. Radial spines: About (17-)30-45, appressed, slender, interlacing and straight, 3-4.5(-6) mm long,white or pale tan, weak. Central spines: 6 to 12 (usually 7), much stouter and longer, contrast sharply with the slender, numerous, whitish radial spines, They are rigid, swollen basally, spreading, more or less ascending, greyish, reddish, brown to bluish black or nearly white, with darker tips, 4-12 mm long, upper one stout, characteristically is curved upward and blue-gray on the distal half. In this feature young single-stemmed plants of M. pottsii may resemble Echinomastus mariposensis that occurrs in the same area. Juvenile specimens typically have fewer central and radial spines. In lower (older) areoles of juveniles there are perhaps 2-3 central spines, and the number of centrals increases to about five in areoles at midstem. Even in juveniles the centrals are packed together in an oval configuration, bulbous-based and diffusely spreading. Flowers; Born in a circle about 2 cm below top of plant, campanulate but not opening widely, brownish red, deep red, or rusty-red, or reddish-purple, about 9-15 mm long and 6-13 mm in diameter; inner perianth-segments light purple, somewhat reflexed near the tips, acute usually with a darker midregion and paler margins. Stamens pale cream-colored to pale yellow, much shorter than the style, purplish above; stigma-lobes 4-5 narrow reddish-purple to orange-yellow. Phenology (in habitat): This species blooms in late February to March, rarely later. The small flowers of M. pottsii open about noon or before for at least three days, often 5-6 days, and close at night. Fruits: Red, clavate about 15 mm long. Fruit development and ripening under natural conditions appear to require one to several months. Seeds: Black, blackish brown, or dark reddish-brown the surface deeply, nearly oval, and ca. 1 mm long. Chromosome nunmber: 2n = 22. Bibliography: Plants more or less cespitose branching basally and along the stems, although single-stemmed, presumably young plants are not uncommon. This species is widely grown in collections but the flowers are inconspicuous. M. pottsii is similar to some plants of Escobaria tuberculosa and Escobaria albicolumnaria, both of which occur in the same area, but these species are readily distinguished by stem, spine, flower, and fruit characters. Cultivation and Propagation: Mammillaria pottsii comes from an area of summer rainfall and is supposed to be not the most easiest species in cultivation, as particularly sensible to moisture excesses. It will offset profusely.